I have fond memories of Thanksgivings spent visiting family in Grass Valley. The streets of this Northern California Gold Rush town is steeped in history, which comes alive each holiday season with its Cornish Christmas celebration. A tradition for nearly 50 years, Cornish Christmas started as a way to preserve Grass Valley’s Cornish heritage and holiday traditions. Beginning the day after Thanksgiving and running each Friday night through Christmas, the streets of downtown Grass Valley are filled with the sights and sounds of an old-fashioned Christmas: carolers dressed in Victorian garb singing from the steps of historic buildings, chestnuts roasting over an open fire, and all of downtown trimmed in twinkling lights and holiday splendor. For my family’s part, we always went to Cornish Christmas the night after Thanksgiving. We’d bundle up—and despite some eye rolling and mutterings of “Corny Christmas” from certain family members—we all went: the aunts, the uncles, the nieces, and the grandparents. We’d buy traditional Cornish pasties and cups of Mexican hot chocolate and wander through the streets and the crisp night air. We’d hum along to the music and peruse the multitude of crafts and gifts made by local artisans. When my nieces were small, we would keep our eye out for Santa. Afterwards, walking back to the car, a grand Victorian home on Church Street would sometimes catch my eye. I noticed it at other times, too, when I was visiting Grass Valley for various holidays and events. 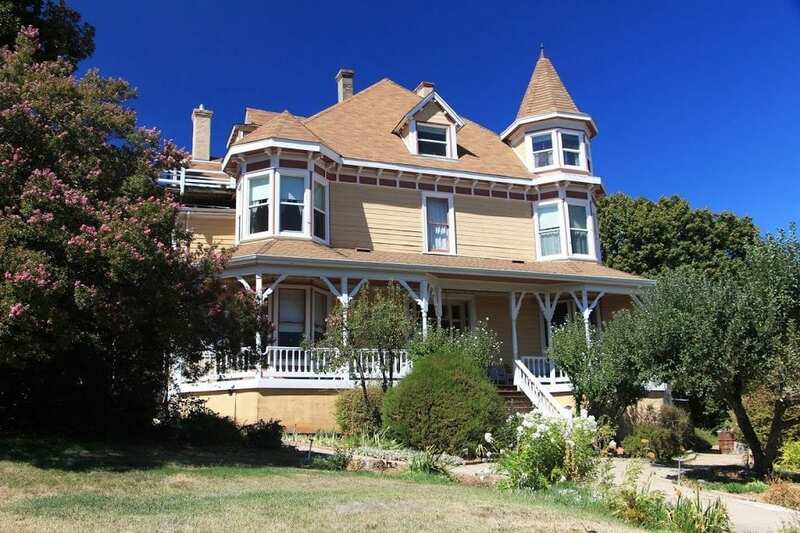 The Victorian was painted cream with red, brown, and white trim and was among of the largest homes in town. 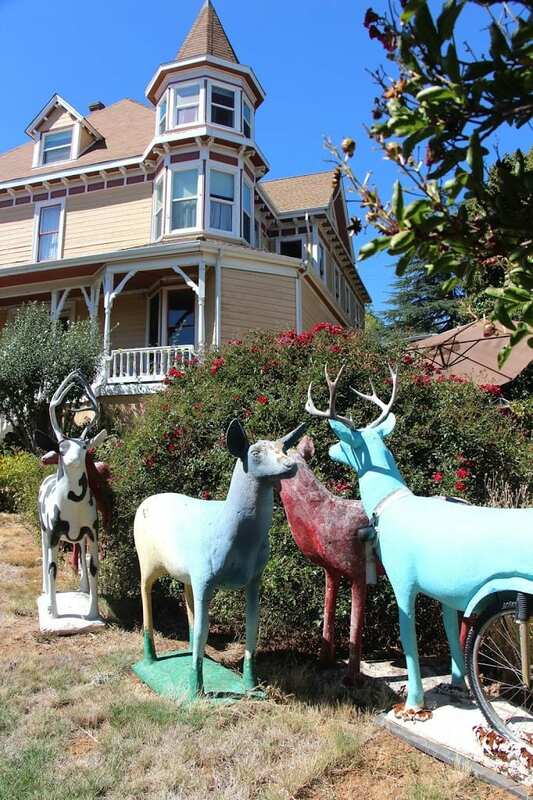 It had a turret, an inviting porch, and a comical collection of deer sculptures in the front yard. One deer was painted with black and white splotches like a Holstein cow; another had a bike wheel for its hind leg. I no longer have family in Grass Valley, and almost a decade had passed since I last visited the town, but I had the chance to return this fall and meet the owners of that eye-catching Victorian: the Swan Levine House. In the mid-1970s, two printmaking artists from San Francisco were looking for a place to build a printmaking studio, show their work, and accommodate guests. Friends had told them about the old Jones Hospital in Grass Valley, so Howard and Peggy Levine drove up in their orange Volkswagen Bus to take a look. Sharing a passion for history and historical preservation, they saw potential in the shuttered hospital with an eclectic past. The house had originally been built in 1867 by John and Catherine Fahey, who were partners in the Alison Ranch Mine. They sold it to William Campbell, a local merchant who made his fortune selling general merchandise mining equipment. After a damaging fire in 1895, Campbell remodeled the house to its current Queen Anne style. Following Campbell’s death, two doctors who were also brothers, Doctors Carl and John Jones, acquired the house in 1906 and turned it into a hospital named for their father, Dr. W.C. Jones. Howard and Peggy purchased the house in 1974 and began the work of renovating it—taking up linoleum, sanding floors, repairing plaster, and painting walls—before opening to guests as the Swan Levine House. 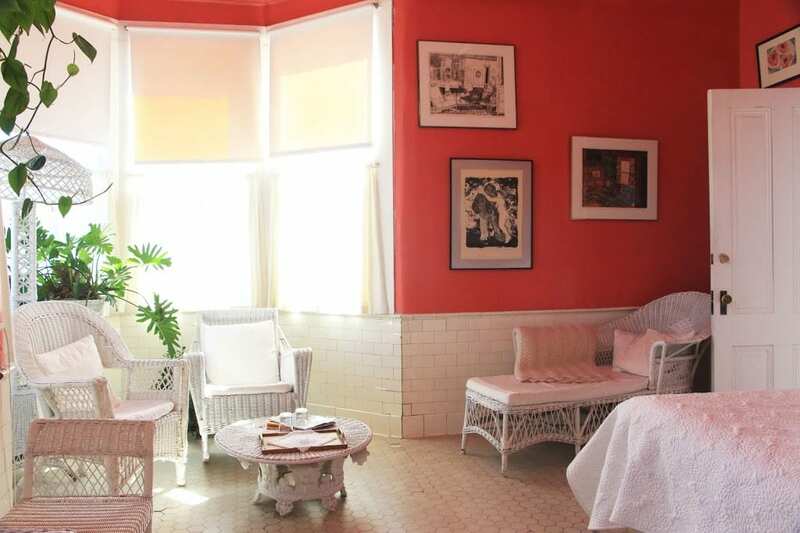 The former hospital surgery room was converted into a spacious, sunny guest room with enormous turret windows, bright fuchsia walls, white hexagon tile floors, white wicker antiques, a king-size bed, and cabinets filled with curiosities from the house. The private bath features the original surgical scrub sinks and a claw foot tub with a shower. 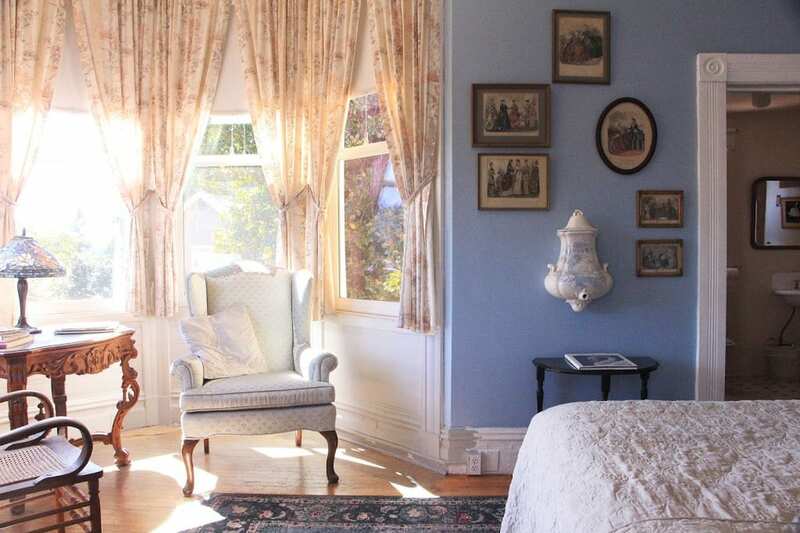 The original master bedroom of the house, called the Suite, is decorated in traditional Victorian style in soothing hues of pale blue and cream. Light streams in from the large turret windows surrounding an intimate seating area—perfect for curling up with a book. A separate sitting room features a beautiful antique-tiled fireplace trimmed with oak. The private bath offers an inviting claw foot tub with a shower. 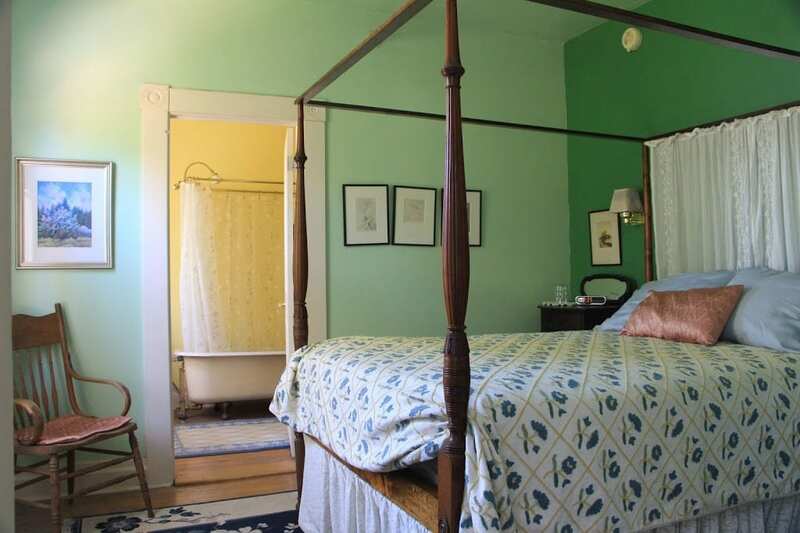 The Green Suite pays homage to the hospital colors of the period with pale green and yellow walls, an antique four poster bed, a comfy seating area with a pull-out sofa, and a large private bath with a claw foot tub and shower. The inn’s fourth room, the Apartment, was part of an addition the hospital built in the 1930s and it has a time capsule quality. The Apartment has kitchenette, a queen and two single beds, and is furnished with kitschy 1940s and 50s antiques and memorabilia. All through the house, the rooms and halls are brimming with art and antiques that reflect Howard and Peggy’s humor and eclectic tastes. “We don’t do the Hilton look,” said Peggy as she gave me the tour. 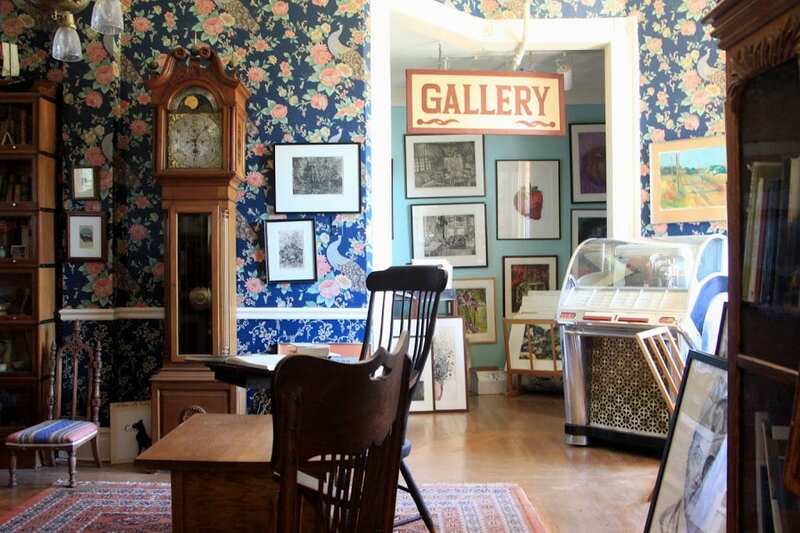 In addition to renovating the former hospital into a guesthouse, Howard and Peggy also converted the home’s former carriage house into their printmaking studio. The studio is equipped with one litho press and three etching presses. They also have silk screens, tools for wood engraving, and plates for monotype and monoprint. The studio can be rented for $50 per day plus materials; instruction is available by arrangement. The parlor of the Swan Levine House serves as a gallery for Howard and Peggy’s fine art prints spanning five decades. In addition to creating art and hosting guests, they also raised three children in the house. One son was a dancer with the Joffrey Ballet. Another is a infographic journalist with the Sacramento Bee. Their daughter teaches high school in Sacramento. Howard and Peggy’s involvement in the local community runs deep. Howard is the vice mayor of Grass Valley and teaches drawing and printmaking at Sierra College. Peggy is on the Board for the Center for the Arts and is active in the restoration of The North Star House, which was designed by Julia Morgan. Both have volunteered or served on the boards for a number of local fine and performing arts organizations. Chatting with them in their cheery kitchen with its rich, cobalt blue-painted cabinets, the conversation ranges from family to art to history to architecture. As innkeepers, this is what they enjoy most: talking with their guests. 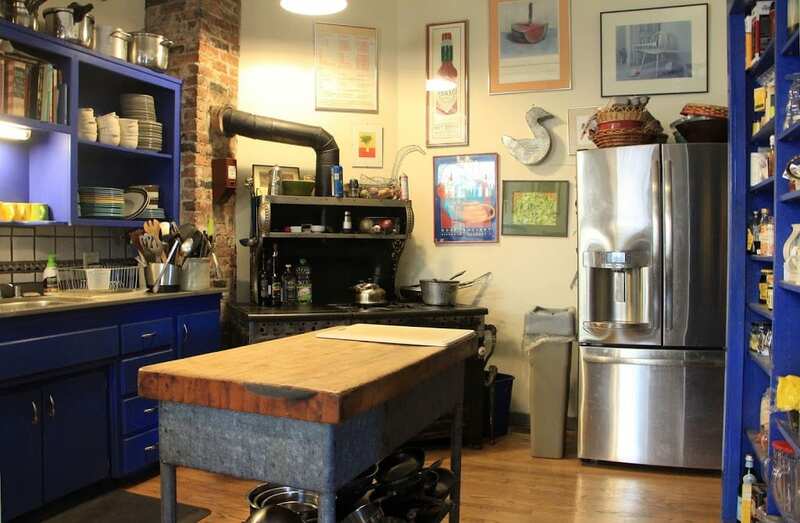 Each morning, Howard cooks breakfast over a vintage stove and guests gather to indulge in the conversation. Sometimes, Howard and Peggy find it difficult to shoo their guests out of the kitchen long enough to enjoy their breakfasts in the dining room. 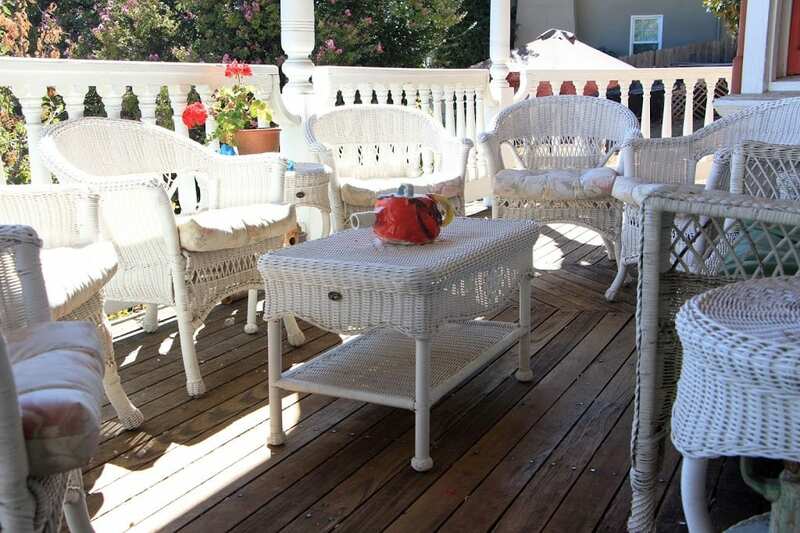 Over the past 40 years of hosting guests, about a hundred former guests have since moved and made Grass Valley their home. With Howard and Peggy as their introduction to this historic, arts-infused town in the Sierra Foothills, it’s easy to understand why.